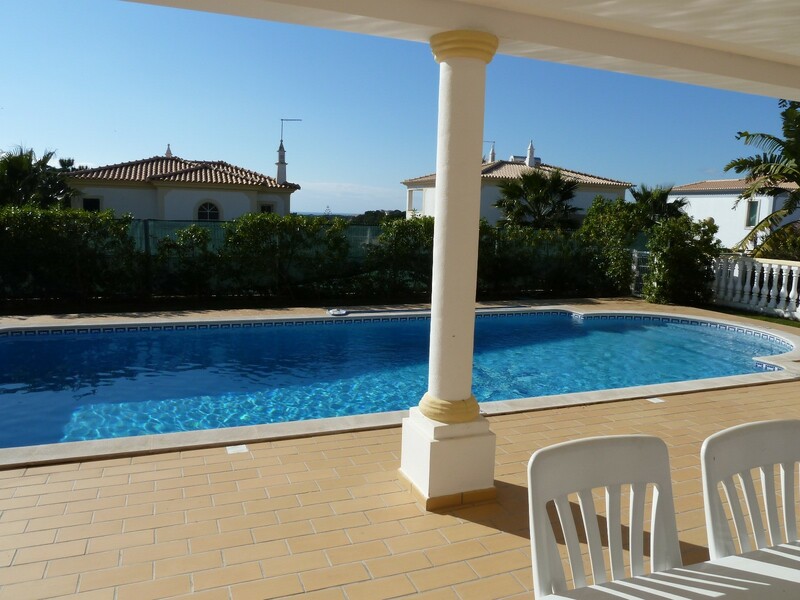 Estrelicia's sunny, south facing pool & sea views! Fully fitted kitchen overlooking pool lawn & sea. Spacious open plan, lounge/dinner & kitchen. Light & bright lounge/diner with doors to pool. Ground floor bedroom with terrace to garden . 1st floor double bedroom, with doors to terrace. 1st floor, en suite room with doors to terrace. Terrace & sea views from 1st floor bedroom/s. Eulalia! The local, picture postcard beach, 2 klm. Santa Eulalia. The local, picture postcard beach. Balaia's green coastline & best beaches in Europe! Olhos Agua! Another beautiful local beach! 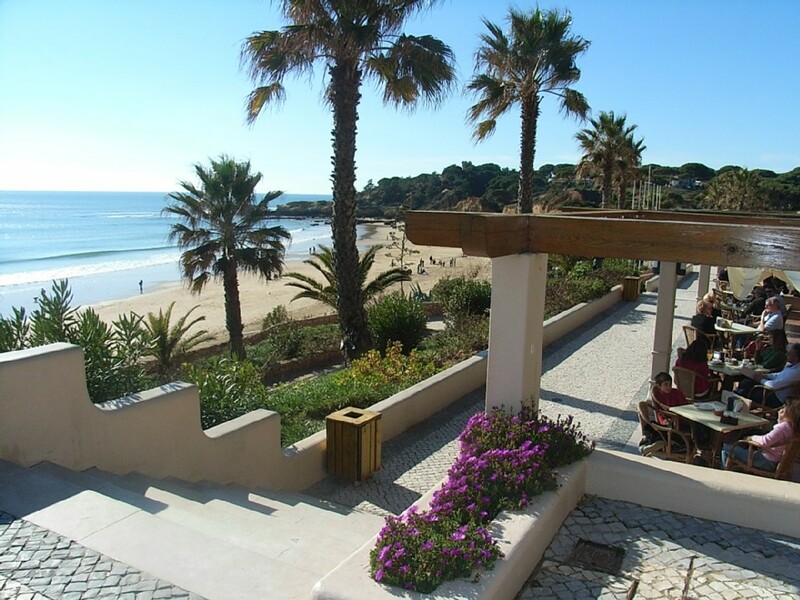 Colourfu & lively, Praia Oura is just over 2 klms. Visit, the famous Fisherman's beach & town. High Quality Villa, 3 Bedroom Villa with Air-Conditioning, Large Private Pool, with Sea & Panoramic Views, Near Beaches. 3 Bedrooms, 3 en-suite bathrooms, luxury villa for 6- 8 persons + infants. New, luxury villa with air conditioning occupies a prime location with sea views, in the beautifull Quinta da Balaia Resort. 3 bedrooms, 3 bathrooms, with optional extra 2 air conditioning bedrooms, 1 bathroom, lounge, in the lower floor, for up to a further 4 persons (see property No.450076). Large 9×4.5m pool (heated pool & internet available, extra cost). Balaia is one of the most delightful spots on the Algarve with extensive lawns & plants covering an area of 35,000 square metres, just 1.8 km from many, stunning, picture postcard beaches, walking distance to shops & restaurants. Within the complex, there’s street lighting, security, extensive gardens with thousands of well maintained trees & plants, creating a relaxed & comfortable atmosphere. 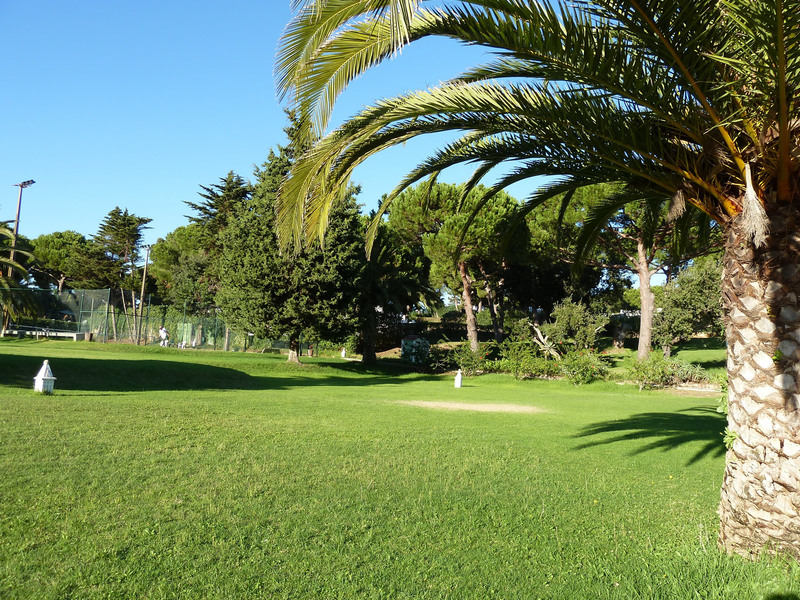 Within Balaia, there’s also a restaurant (seasonal), serving drinks, snacks, lunches and dinners, served inside or during besides the pool, several all-weather tennis courts (two floodlit), mini market, communal pool & childrens playground. Villa Estrelicia in a class above the rest! : Villa Estrelicia is a newly built ! Air Conditioning, Luxury Villa with Sea Views, Built to extremely high standards, on the highest point of ‘Quinta da Balaia’, a very popular, quality complex resort . Large 9 x 4.5 metres pool with several built-in, wide roman steps to pool, surrounding terrace & lawn, pool heating (available, extra cost) ! Surrounding lawn & gardens, Poolside, Sunny! South Facing Terrace, commanding superb views of the surrounding villas, Land & Sea Views! First floor bedrooms have a very spacious terrace! Then, there is a further terrace! A magnificent, roof-top panoramic terrace commanding, amazing, undisturbed land & sea views of the whole coastline & countryside, as far as the eyes can see! 3 modern, en-suite bedrooms & bathrooms. Guaranteed great views staying at this superb, air conditioning villa, in Quinta da Balaia’s Beautiful Complex Resort, Very Private Villa! Perfectly Located! Yet, close to absolutely everything! A Little piece of heaven! Picturesque, quite location with many facilities, including mini market, restaurant, tennis, children’s playground. Or! 1.3 Kilometres away, there’s a wide and varied choice, of many shops, irestaurants, bars, supermarkets, hairdressers, cafes, bars & night life. There are many beautiful nearby, sandy beaches including the local picture postcard Bue Flag Beach of Santa Eulalia, only 1.8 klms away!. As for, shopping, there’s the narby Modelo shopping, for good supermarket shopping complete with a taxi rank outside, under 3klms away. For big shopping mall, there’s no better place than Guia/Albufeira shopping open late!. Home to the best shopping mall, on the Algarve, and, it’s just 10 minutes drive from the villa! 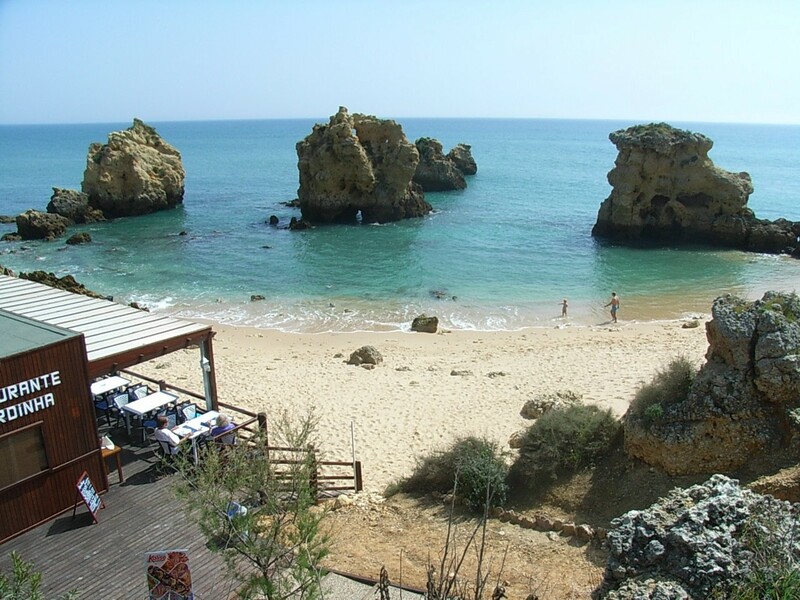 There are many beaches nearby; Olhos de Agua is a must.! Colorful Praia da Oura beach, Albufeira’s old town Fisherman’s beach, Sao Rafael beach, Arrifes beach, our favourite little hideaway beach, located besides Sao Rafael beach & more…all small pretty beaches, complete with own restaurant & bar. Quality, Luxury Villa, Air-Conditioning, 3 Bedroom, 3 Bathroom, High Quality Luxury Villa located in the popular, up market Quinta da Balaia Resort, in Balaia, Albufeira. One of the most delightful spots on the Algarve with extensive lawns and lush vegetation covering an area of 35,000 square metres and, just 1.8 kilometres away from picture postcard beaches. The Quinta da Balaia Resort and Villa Estrelicia, offers, private and relaxed surroundings, yet, close to absolutely everything! Within 1.3 kilometres distance you’ll find many shops, including a wide & varied choice of restaurants, bars, supermarkets and hairdressers. 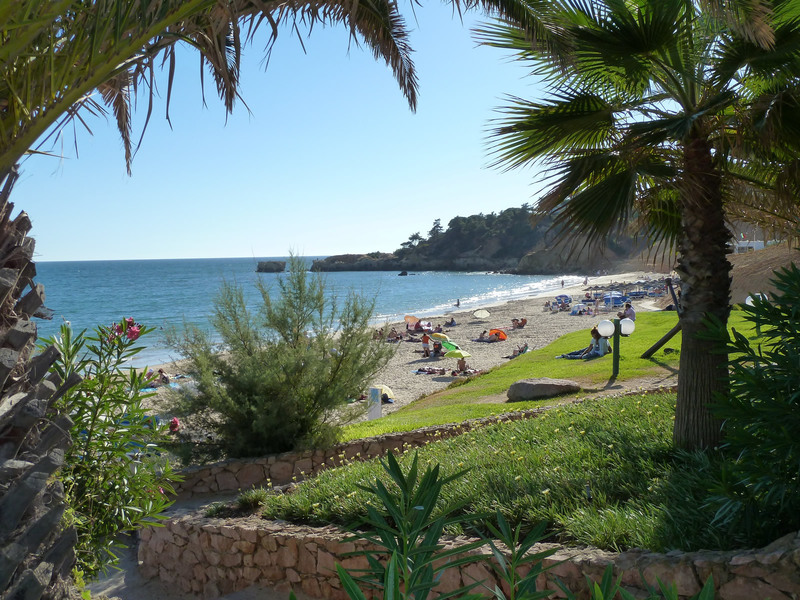 Only 1.8 kilometres from the lovely, picture postcard, sandy beach of Santa Eulalia. As for big shopping mall, there’s no better place than Albufeira shopping. Home to the best shopping mall, on the Algarve, and it’s just 10 minutes drive from the villa. There are several, nearby golf courses. And Faro airport is only 30 minutes drive or transfer (33 kilometres). Vale do lobo and quinta do lago with six, 18 hole golf couses, including the aclaimed par 72, 6238m san lourenzo golf course. Other algarve courses- as for all other golf couses throughout the algarve, they are also easily accessable, within short distances by car, by motorway which is 5 minutes drive from the villa. All bedrooms have air conditioning for cold & hot air, private bathroom, marble flooring throughout, built- in wardrobe, light & modern furniture, bedside cabinet/s & sound system. 1st Floor. Sea views. Twin beds, Double doors to terrace & access to stairs leading to a large, rooftop panoramic terrace, commanding magnificent, undisturbed, coastline & countryside views. 1st Floor. Double bed, T.V, Safe, Double doors to terrace & access to stairs, also leading to the large, rooftop panoramic terrace, commanding magnificent views of the coastline & countryside. Ground floor. Largest room. Twin beds, Double doors leading to terrace, table & chairs. * All year! :- Once weekly main clean before arrival, with extra towels given per week for your use. Thereafter, once a week main clean, with change of linen, bathroom & pool towels, with 1 extra set of bathroom & pool towels for your use for the week. Ground Floor:- Largest, Private en-suite bathroom with window. Consisting of light marble throughout, from floor to ceiling, with bath/shower, bidet, WC & double basin. 1st Floor:-Private en-suite bathroom with window. Consisting of light marble throughout, from floor to ceiling, with bath/shower, bidet, WC & basin. 1st Floor:- Private en-suite bathroom with window. Consisting of light marble throughout, from floor to ceiling, with bath/shower, WC a& basin. Ground Floor:- Cloak Room. Consisting of marble flooring with WC & basin. Please note: Luxury Villa is qualified, only because it has air conditioning. (VILLA ESTRELICIA) *3 Bedrooms, 3 Bathrooms *Large, Pool 9 x 4.5 meters (heated extra cost) *Air Conditioning for cold or hot air *Maid service *Internet access (optional) *Marble flooring throughout *Cable TV, & DVD PLAYER *Stereo Sound System in all rooms including pool terrace *Coffee machine *Hair Dryer *Partly covered terrace * Garden & Lawn * 9 x 4.5 meters freshwater pool with built-in steps (1.16 metres to 1.82 meters deep) *Gated Villa *Car hire recommended, but not essential. FACILITIES WITHIN QUINTA DA BALAIA * Extensive gardens * Mini Market *Public telephone *Children’s playground *Communual poolside restaurant and bar (seasonal). *This villa can also be rented exclusively yours, or with 5 bedrooms, see property No. 450076 for details. The villa was immaculate and was exactly what was promised in the description. It had simply everything we needed for our holiday. The luxury of the built in sound system in every room (and on the terrace by the pool!) made the holiday for us – we loved it and worked perfectly with iPod and iPhone. The roof terrace catches the sun at all times of day and we watched the sunset from the top terrace each evening – the 360 degree view was perfect. 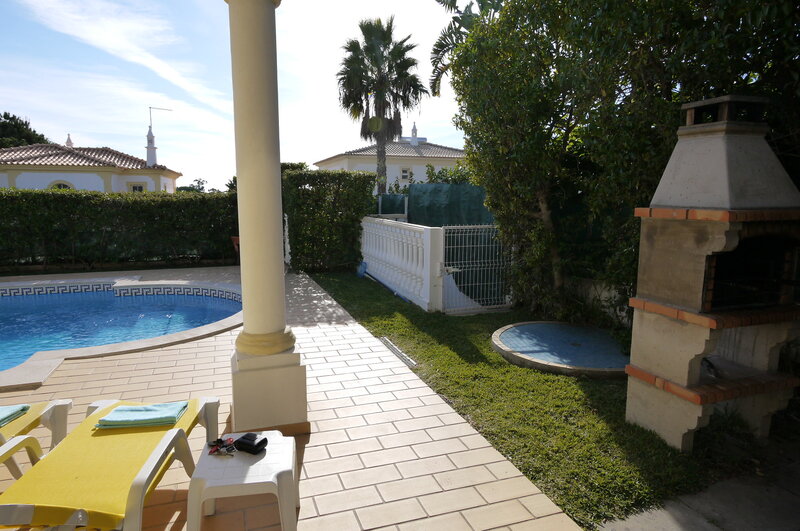 The villa is located in a very peaceful complex with great little kids park and shop. 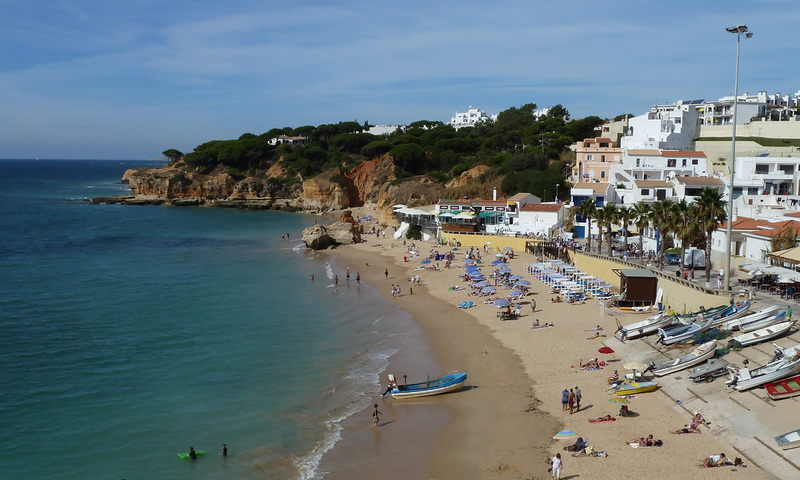 The beach was less than 10 minutes drive away and similar distance into Albufeira town. Carlos provided all the information we could possibly need and responded very quickly to all our questions – we couldn’t have asked for more! We will definitely book again!! Totally enjoyed our stay at Villa Estrelicia. It was fabulous from start to finish The location was perfect for us, it was far enough away from the hustle and bustle but not not too far if you wanted to have a good night out. The villa was very clean and spacious. The welcome pack was a nice gesture, especially if you arrive late at night. The pool area was very clean and tidy, surrounded by garden furniture and sunbeds. The villa is in a quite location and I would recommend the use or hire of a car. Carlos was very helpful and a pleasure to deal with. We totally enjoyed our stay at the villa and would highly recommend it. We spent the month of march at the villa with our two boys and had the best time. The villa was great and just as described, super pool and a wonderful view. Amazing beaches near by. Carlos was very helpful and sweet as usual. We stayed at one of his other villas, villa Borboleta 8 years ago and Carlos’s sense of service, helpfulness and of course the beautiful villas was the main reason we returned. We can highly recommend a stay at the villa. My wife and I recently returned from this amazing villa after an 11 night holiday . We booked this direct with Carlos who organised everything for us which included a nice welcome pack on arrival . Carlos is very much hands on and wants to be contacted immediately if you have any questions or problems which we did initially but he had them all sorted out for us with 1 phone call . The villa itself is very private with no one overlooking you but near enough to other villa’s so you are not miles away from anyone and within a 5 minute walk to the small supermarket which sells the basics . Jose who picked us up from the airport which Carlos can arrange was great throughout , we used him every night to take us into the Old Town of Albufeira , he also waited for us on our first day when he took us to a large supermarket as we arrived early and the villa was being cleaned . I would recommend the additional cost of pool lighting , it really did add to the atmostphere of the villa on an evening . You can walk into the Old Town but it would take you about 30 minutes so I would recommend a taxi . The villa is very safe and secure with the pool and surrounding outdoor space fantastic so would accommodate a larger party with no difficulty . We only went into the Old Town but we were told for a more lively night visit the ” strip ” in the New Town . The Clay Oven Indian is a must to eat at and there is every possible restaurant you could want to cater for everyones tastes in the Old Town , or just eat in on the BBQ . I would definately recommend this and have done to our family and friends . So thank you Carlos for all your help , plus advice on where to eat etc , we would definately go back , but this time for longer . You won’t be disappointed if you book this villa ! . My family and parents rented this villa for 2 weeks and we had the most wonderful vacation. 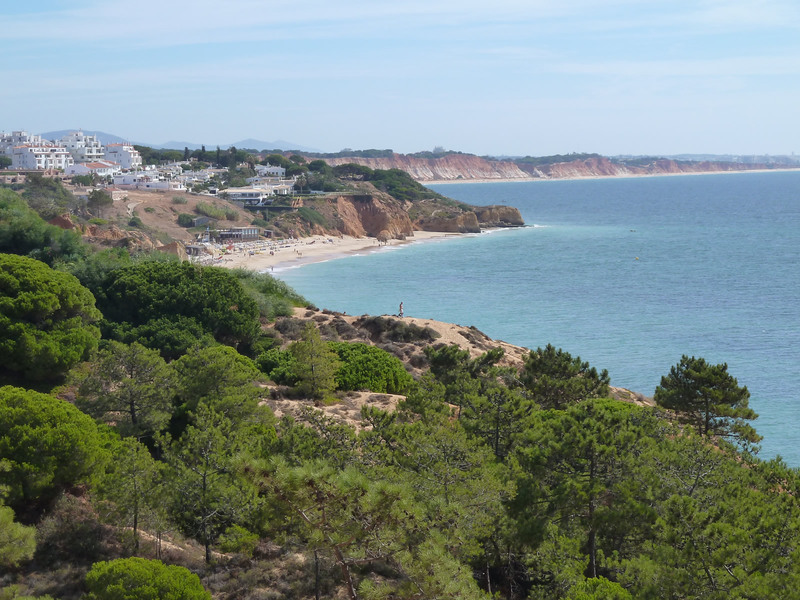 First of all the place is wonderfully located in Albufeira which is right in the middle of the Algarve and very close to the beautiful Santa Eulalia beach to which I jogged to almost every morning. It was a great location to do daily trips across the Algarve. The spacious villa and the huge pool were impecably clean and had all the amenities. The place felt very safe and the surroundings are beautiful and peaceful. The property manager Carlos was very professional and very helpful. We really enjoyed our stay and would not hesitate to go back or recommend it to friends. Recommended for: Families with Young Children, Sightseeing, Tourists without a Car, Adventure Seekers, Age 55+, Romantic Getaway, Families with Teenagers. This was our first villa holiday and I was a bit apprehensive, however the transfer was waiting at the airport as arrange. The villa, well this perfect, exactly as the web had described it. Everything was spotless, the rooms were better than expected, having the ensuites a bonus. This holiday was my husband and myself, our daughter and son his wife, and their two boys aged 18mths and 32mths. I would recommend this villa for families as the secluded gardens meant that the boys were safe. Having our own pool, meant that the children were in every day until late at night. Carlos was excellent and very helpful, he even contacted the makers of the music system in the villa to see if we could connect an ipad to the input. We would love to go back again, thanks again so much Carlos for a wonderful holiday experience. Wat een villa! Nog nooit mee gemaakt dat de foto’s overeen komen met de werkelijkheid! Een aanrader voor iedereen! Super zwembad, ruime woning, elke week nieuwe handdoeken incl badlakens en ook elke week bedverschoning! Bedden waren al op gemaakt bij aankomst en er stond een welkom mandje klaar met vers fruit en chocolade! Internet werkt ook perfect en de taxi service die de eigenaar aanraadt is ook goedkoop en vriendelijk! Veel zitplaatsen buiten en binnen, ligbedden zo comfortabel allemaal! Eigenlijk maar 1 nadeeltje aan deze woning: er bevindt zich geen skigebied in de buurt, dus moeten we voor de wintersport genoegen nemen met minder…. Beter dan dit ga je niet tegen komen! Wij gaan zeker terug in zomer of najaar! Want 12 dagen zon in oktober bevalt ons wel! Carlos, thank you Very much for the service! There is no better home than your home! I am very pleased for you and your family, that Villa Estrelicia, has fulfilled all your requirements for your family holiday. Thank you very much, for finding the time to write, sharing your experiences at Villa Estrelicia. just spent 2 weeks at Villa Estrelicia and without doubt this is a top class villa with all modern fixtures and fittings. From the wall controlled radio with speaker in ceiling for every room and pool terrace to the modern kitchens and bathrooms this villa earns top marks. Bedrooms are very comfortable and roomy, as is the lounge. The roof terrace views are amazing and a great place to cool off and watch the sun go down. Pool is fantastic and well cared for as the surrounding gardens are. Maids and pool man very discreet plus lots of pool towels for guests to use so more room in your suitcase! The location is also perfect for a walk into St. Eulalia /Strip for restaurants,bars,shopping all within 10/15 mins slow stroll plus well stocked mini market and restaurant on site. Would recommend this Villa to anybody. Many thanks Carlos.Recommended for: Families with Young Children, Sightseeing, Girls Getaway, Tourists without a Car, Adventure Seekers, Age 55+, Romantic Getaway, Families with Teenagers. Villa was outstanding in every way – fully fitted with everyhting that a family or a couple would ever need. Roff top & bedroom terraces are fantastic sun traps.Recommended for: Families with Young Children, Sightseeing, Age 55+. Although we have had self catering holidays in the past this was our first experience of renting a villa. Where to start? From the outset Carlos could not have been more helpful, offering useful advice as to which accommodation would best suit our party. Having decided on villa Estrelicia the booking process was straightforward and Carlos arranged for a reliable transfer service to meet us at the airport. On arriving at the villa we were met by Carlos who was in Portugal at the time. We were given a comprehensive tour of the property and advised as to how everything worked. (During our stay we did experience one or two “teething problems” with the security alarm and the sound system which were promptly resolved — this is a new villa after all!). The generous welcome pack was much appreciated as was the advice available re local restaurants, taxis, attractions etc. The villa itself is top quality in every aspect. All the facilities from the aircon to the fully fitted kitchen, the bathrooms, the pool etc were of a high standard. As promised both the villa and the pool were cleaned by pleasant friendly staff during our stay. We did not hire a car but were able to book taxis from reception. (Average fare to the old town for 4 adults plus 1 infant about 5 to 6 euros). We used the same transport (Daily Tours) as had collected us from the airport for a visit to Zoomarine which I would highly recommend. We stocked up from the local Mondelo supermarket and enjoyed poolside barbeques. The location and the layout of this villa means that it is suitable for a variety of groups, families, couples etc, etc and I would have no hesitation in recommending it. For the standard of quality and the exceptional customer service it is great value for money.Recommended for: Families with Young Children, Girls Getaway, Tourists without a Car, Age 55+, Romantic Getaway, Families with Teenagers. Toda nuestraestancia en la casa ha sido perfecta. Las instalaciones están en muy buen estado y la piscina es fenomenal. Las indicaciones de Carlos sobre restaurantes son todas acertadas.Espero poder volver el año próximo. Recommended for: Tourists without a Car, Age 55+, Romantic Getaway. The Villa is a perfect combination of central location, privacy and luxury, the Quinta Da Balaia area and Albufeira has many things to offer from restaurants, attractions, Golf, Shops and of course the amazing beaches. Carlos was very helpful in suggesting places to eat and visit. Would highly recommend to any one that wants to enjoys the Algarve area and have the peace and quiet of a private Villa.Recommended for: Families with Young Children, Families with Teenagers. Have just returned from 12 days in this fantastic villa. Such a nice complex just far enough away from the centre of town. Carlos the owner is so helpful in booking the accomodation and providing you with local info. Would definately recommend this to anyone looking for a relaxing and luxurious break. Recommended for: People with Disabilities, Families with Young Children, Girls Getaway, Romantic Getaway, Families with Teenagers. I recommend this villa by anyone, never seen such complete house, the pool was splendid and the comfort in this house is very high, especcialy the loud installation (? ), in the entire villa is modern. Also it was nice that there were several dvd’s to watch, n all kinds. The villa was very clean and there is a lot of space . So everyone who hesitates, just go and book, you won’t be disappointed!! The park in wich the villa is situated is quiet and very good taken care of. I hope you have a great time during your stay! !Recommended for: People with Disabilities, Pet-friendly, Sightseeing, Age 55+, Families with Teenagers.